Thunder Bay Press, 9781626860681, 320pp. One glance around the local park will confirm that man’s best friend comes in many varieties. As the first animal domesticated by humans, dogs have been selectively bred for tens of thousands of years to be herders, hunters, guard dogs, and friends. The result is a plethora of breeds that are as different as the pint-sized chihuahua and the massive St. Bernard. Now there is a guide to each of them. 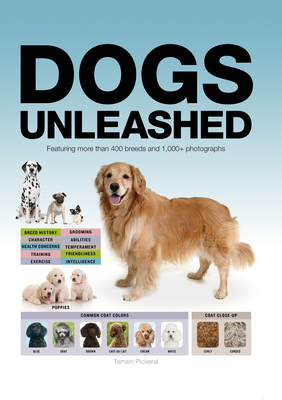 Dogs Unleashed contains all the information required to differentiate breeds of canine. From the standard poodle to the Finnish spritz, readers will become experts of identification. Alongside beautiful photography, discover information on conformation, history, temperament, health risks, and more. This book even contains a section on today’s designer breeds like the labradoodle, the puggle, and the cockapoo. Ideal for researching a new family pet, or for general knowledge, this book reveals which dogs are the most expensive to keep, which are the best swimmers, and which breed has the longest life expectancy. A complete compendium of canine varieties, Dogs Unleashed is one book that is sure to keep tails wagging. Tamsin Pickeral is an animal specialist and an art historian. She grew up in the English countryside, daughter of a veterinary surgeon and surrounded by an eclectic mix of animals including horses, dogs, cats, ferrets, and orphaned squirrels. She has been a devoted dog owner her entire life. Tamsin has lived in Europe and North America, where she worked as a veterinary nurse for many years. She is a widely published international author who has written a number of books on animal themes, which have been widely acclaimed in the press. These include The Spirit of the Dog; The Dog: 5,000 Years of the Dog in Art (voted into the top fifty art books of the year); The Grace of the Cat (winner of the Golden Purr Award); The Majesty of the Horse; and The Horse: 30,000 Years of the Horse in Art. Tamsin lives and writes in Norfolk, England. For more information please visit www.tamsinpickeral.com.